Starting from the end of the 19th century Qatar was ruled by the Ottoman Empire. During World War I the Ottoman Empire fell into disorder and Qatar became a British protectorate. The United Kingdom guaranteed protection to Qatar from intrusion from the sea. Britain started losing its influence over Qatar after the end of World War II, particularly, when India and Pakistan gained their independence. Oil became a major resource of revenue in Qatar and this strengthened the country and its economy. Moreover, during the 1950s the pressure for British withdrawal was increased by the Arab emirates. Qatar joined a federation of Trucial States, but due to some territorial disputes Qatar resigned from the coalition, that eventually would form the United Arab Emirates. 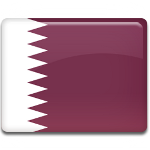 Qatar gained independence from the United Kingdom on September 3, 1971. After 1974 Qatar's wealth grew rapidly and now it's one of the richest countries in the world.